Archaeologists digging in the Black Desert of Jordan have found the oldest-known bread in the world. Created 14,400 years ago, the charred, unleavened cracker predates proper agriculture by thousands of years, an international team reported Monday in the Proceedings of the National Academy of Sciences. Discovering the delights of gluten may have spurred enterprising hunter-gatherers among the Natufians (prehistoric peoples in the Levant) to try to grow the ingredients; that may have helped drive the Neolithic agricultural revolution, suggest the archaeologists from the University of Copenhagen, University College of London and University of Cambridge. It isn't that this prehistoric pita somehow survived the centuries without moldering. 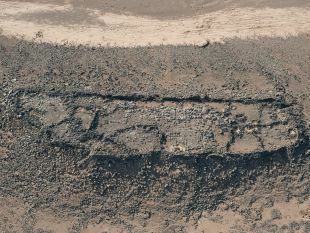 Charred remains found in fireplaces at the site were identified as "bread-like" by rigorous archaeological criteria. Microscopic analysis of the fireplace finds showed the locals used about 95 different plants, mostly a bulrush that produces edible roots, shoots and "nutlets". They also found barley, oats and wheat. However, whether or not these ancient people in the Levant, the Natufians, deliberately grew and nurtured the grains or opportunistically collected edible weeds is not clear. Neither bread nor the grain used to make it should be taken for granted. As foods go, bread is a recent invention, but then so is agriculture. Actually, "cultivation" seems to have stutteringly begun thousands of years before this bread was baked. 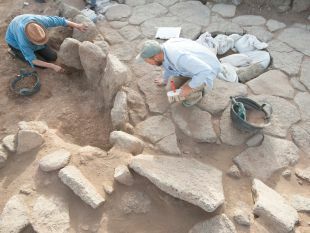 At Ohalo, a site in Israel by the Sea of Galilee, archaeologists have controversially identified grain cultivation going back 23,000 years. Prof. Tobias Richter, who led the excavations at Shubayqa, explains the difference between "cultivation" and "agriculture." There's a lot of evidence for plant processing in Israel and the Levant during the Late Epipalaeolithic, between 23,000 and 11,500 years ago, Richter tells Haaretz. But it's sporadic. Archaeologists have not found other signs of plant cultivation for thousands of years following Ohalo. If there was early cultivation – not all archaeologists agree on that – it was small-scale and probably opportunistic, Richter sums up: "It was practiced and then disappeared again, but maybe didn’t gain a foothold right away." 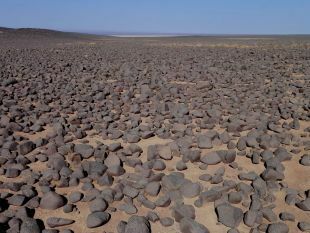 Cultivation in the Levant became more rooted in the subsequent Pre-Pottery Neolithic A phase, between 9,500 to 8,600 B.C.E., Richter says. But it remained an augmentation: gathered wild plants were still key to diet. It would only be in the next phase of the Neolithic, the Pre-Pottery Neolithic B phase that barley and einkorn wheat would domesticated. Wild can be distinguished from domestic plant by morphology. For instance, wild wheat spikelets are dispersed by the wind; domestic wheat spikelets have to be manually shaken off the sheaf. "These plants are more suitable for human use, because they can be harvested more easily," Richter explains. "Selection of these particular plants leads to the emergence of the domestication syndrome, i.e. plants that become dependent on humans for their reproduction." It was only in the Pre-Pottery Neolithic B phase, still over 10,000 years ago, that domestic-type plants prevailed over wild at most Near East sites, he says. So, in short, archaeologists believe agriculture took millennia to develop, with much travail, trial and error along the way. "True agriculture, meaning when people and plants had become basically dependent on one another, can only be said to be really in place at about 10,500 years ago," Richter sums up. No evidence of agriculture has been found at Shubayqa: the grains were wild-type. Stone tools were found but precious few were sickle blades. Hence the archaeologists' conclusion that the flatbread baked in the Jordanian desert was pre-agriculture, made of gathered ingredients. Desert? 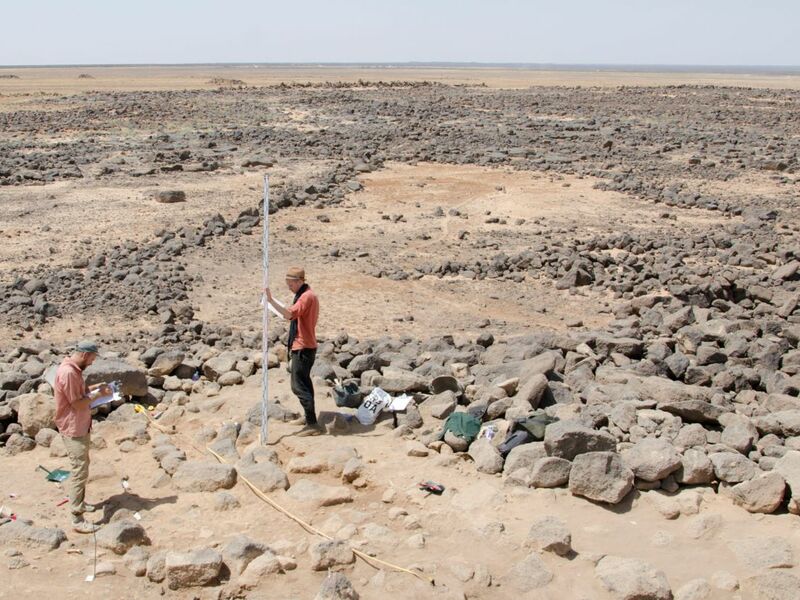 Today it is, but back then the Levantine clime was wetter and Shubayqa was amid wetlands, archaeo-botanical evidence corroborated by animal remains at Shubayqa show. "We have both the remains of waterfowl and wetland plant species (such as the tubers that were added to the flour for the bread) that clearly show the presence of a lagoon or lake," Richter explains. Today the land features mainly rocks and blazing sun but then it was a grassland-like steppe featuring tamarix trees, and abundant in gazelles and other toothsome quadrupeds. Richter adds that the way the Black Desert looks today is highly anthropogenic: too much grazing over centuries. If identifying the start of agriculture is hard, identifying bread that goes back more than a week is also a knotty conundrum. But the archaeologists are confident of their discovery, and that the ancient Shubayqans not only collected oats, barley and wheat. 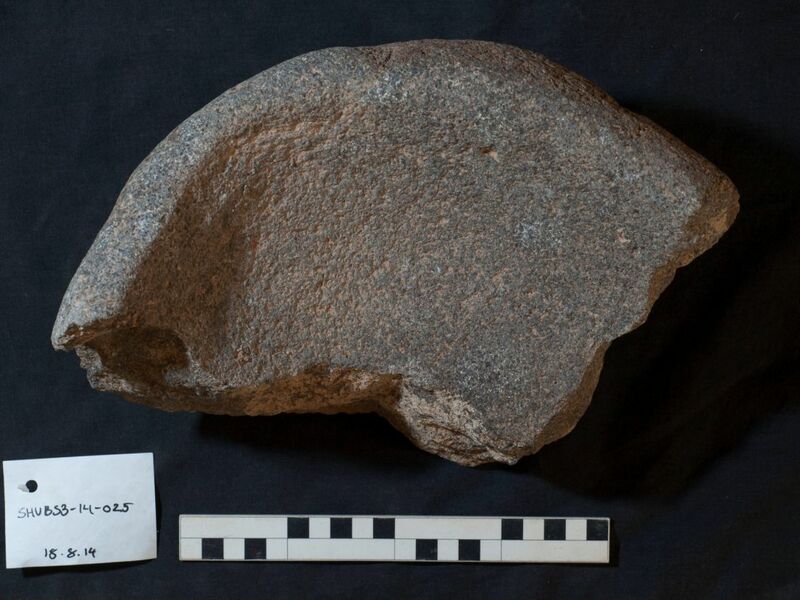 They ground the cereals (giant stone mortars have been found throughout the region, albeit a tad later - dated to about 12,500 to 11,000 years ago), and also sieved it before baking the pita. "Baking" here probably means barbecuing. 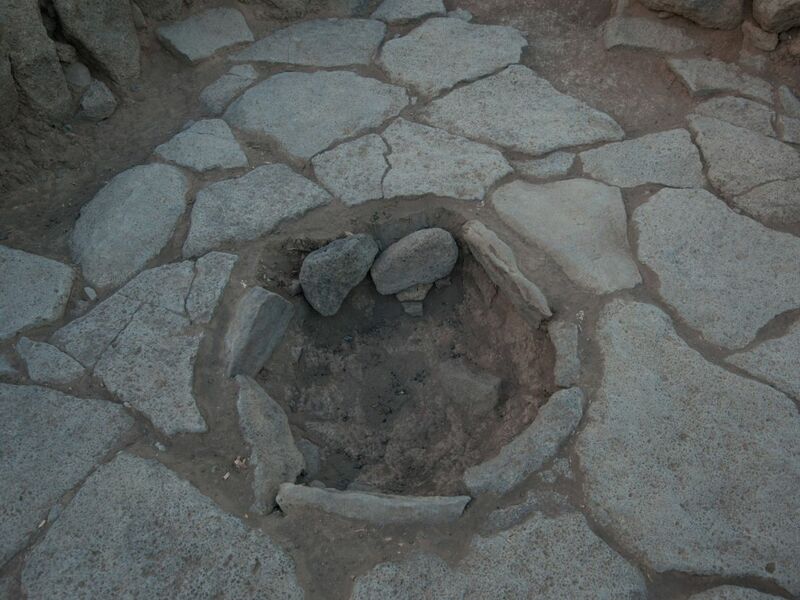 While the prehistoric Asians apparently had a taste for boiling and stewing in pots as much as 20,000 years ago, the prehistoric Levantines cooked over open fires. "The identification of bread or other cereal-based products in archaeology is not straightforward," admits lead author Amaia Arranz-Otaegui of the University of Copenhagen. Dough is made by mixing flour and water and kneading it. The air bubbles in the preserved dough matrix can be observed even 14,400 years later. "We basically rely on a comparison between ancient food fragments and modern analogues of breads, as well as porridge or gruel, that were produced experimentally, charred and then scanned using the scanning electron microscope," Richter explains. "The micro-textures that can be revealed with the scanning electron microscope show very clear and diagnostic differences between charred gruel/ porridge and bread. Hence, we are 100% sure that our results are correct." The thing is, bread is great. It seems possible that once they had made it using wild cereals, with enormous effort, the Natufians were induced to improve their process. Hence, agriculture. It's worth it.